A French amateur pilot's attempt to be the first to cross the channel on a pedal-propelled airship has failed. 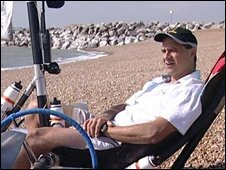 Stephane Rousson, 39, from Nice, took off from Hythe on the Kent coast at about 0800 BST and was half-way to the French coast by 1300 BST. But he was hampered by a change in the wind direction and called off the trip 11 miles from Wissant in France. Mr Rousson said: "I'm not disappointed. I feel happy because it had nothing to do with any technical failure." During the challenge, Mr Rousson was suspended underneath the balloon envelope in a carbon fibre gondola, powering the two propellers with his feet using a bicycle-like contraption. He had been waiting for more than a week for winds of less than 5mph before he could set off. Speaking from France, Rousson said: "We were about three-quarters of the way across but the wind was flowing in the wrong direction for me to make it across. "Unfortunately there was nothing to suggest from the weather forecasts that there was going to be this change in the direction of the wind." A spokeswoman for Mr Rousson said: "To have set off is a victory in itself. He had to wait for just the right weather conditions but they came at the right time." Mr Rousson also failed to make the 34-mile (55km) journey in airship Zeppy in June, despite waiting two weeks for the ideal weather conditions. The venture had been inspired by the Steven Spielberg film ET, he said. "Ever since I was a kid I have dreamed of flying," he added.